Now we're cookin' with gas! The postcard above, and awesome snapshots below, were all kindly submitted by Malls of America regular, Cora Buhlert, in Germany. Thanks, Cora! I love these pictures and appreciate you taking the time to locate and share them. Be sure and drop Cora a line if you need any web designing done, among other things. She has some great International services to offer. 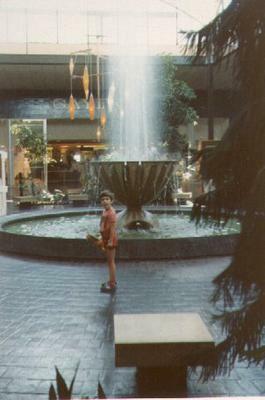 The pictures below were all taken in Edgewater Plaza in 1978. Behold the beauty of that wonderful fountain up close and personal now. What a treat! 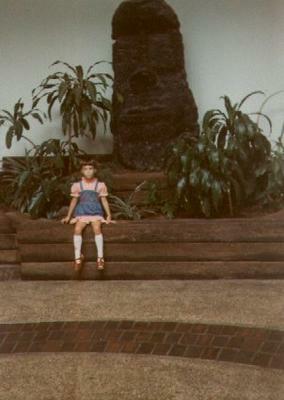 Finally, the two bonus photos below, of Cora (age 5) and her mom next to the famous Golden Fisherman statue in the old Vieux Marche' shopping plaza district in Biloxi, were also taken in 1978. The statue was moved to Point Cadet (Biloxi) in 2002. And hey, check out the old Woolworth's store there on the left! Coolage. Betty Gay stores I've never heard of. Are they still around? I grew up on the MS Gulf Coast and it was great seeing these post cards. The statue of the fisherman throwing the cast net out is now on the west side of the Ocean Springs bridge. Woolworth's always triggers a flood of memories. I checked with my parents and the name Vieux Marche doesn't ring a bell with them, either. 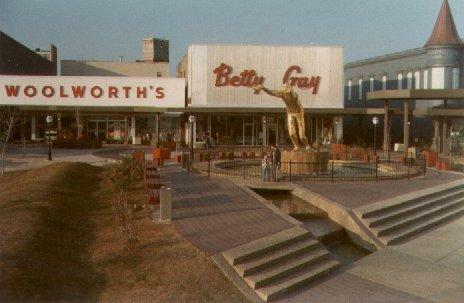 And none of us has any memory of the Betty Gay store, though I wonder if they realized back them how unintentionally funny the name is. 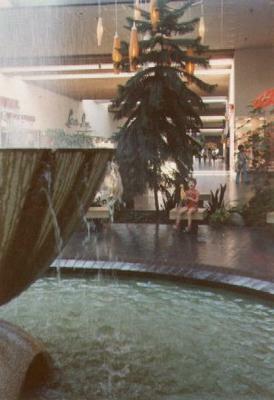 Regarding Edgewater Plaza, the shop with the green-tiled front in the background of the fountain photo was called Gaylord's and was a clothing shop. As far I recall, it was one of the anchor stores at Edgewater Plaza. The other anchor was a Sears store. There was also another clothing store called Lerners (I really liked that shop - they had unusual mannequins), a Walgreens, a toy shop (might have been a Toys R Us, but I'm not sure), a jewellery shop, a photo shop and a hairdresser. Oh yes, and I apologize for the awful red shorts I wear in two of the photos. You've got to blame my parents for that. This is my new favourite website. Thanks, breadmaker, glad to have you aboard! And Cora: Thanks for the wonderful added comments and details! Awesome stuff. Chris, I'm gonna have to get you some good Woolworth pics up soon to feed that habit of yours! Heh. Either here or over on my OLD HAUNTS blog. We'll see. Back when I lived in Mississippi I always liked to go to McRays Department Store in this mall. It was one of my familys most visted spot in the Mall. It has been 25 years since I lived there and this brings back memories. Thanks for the trip back in time. The the old Vieux Marche' shopping plaza district in Biloxi was on a side street near the Edgewater Mall. Man, cool write-up on the Edgewater Mall ! 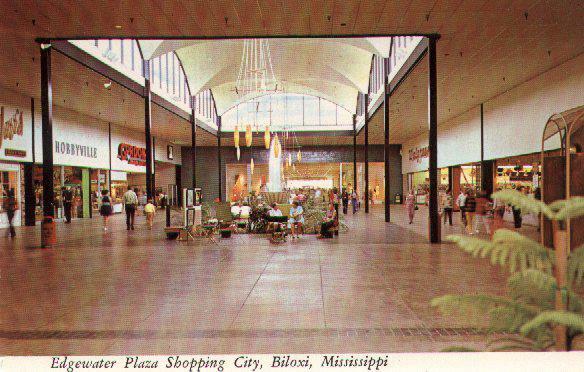 I lived in Biloxi five different times (from the late 60s on) and have been to that mall too many times to count. Last time I was there was in ... umm ... 1985. Too cool. Apparently Edgewater took a pretty bad hit from Katrina. Not sure on specifics but I heard it was bad. Anyone have specifics on Edgewater from Katrina? Went there when I attended school at Keesler AFB two different times in the '70s and '80s. Favorite stores were McRae's (now Belk's) and Gayfer's (now Dillards) and Bookland. I live in Gulf Breeze, FL now, and we've been devastated by hurricanes too. Really hated to see Biloxi torn up like that - loved that place. The mall didn't flood in Katrina, but parts of it had roof damage. Most of the mall is open now. For what it's worth, the golden fisherman didn't survive Katrina. It fell off its base and just sat there while other things, with higher priorities, were taken care of. Then unfortunately, some *bleepity bleeps* decided to break up the statue and steal most of it, thinking they could get some money out of the gold, i suppose. Great pictures, Cora. I used to have a picture of some friends in front of the tiki, but I can't seem to find it anywhere. To the right of the statue used to be a huge painted "you are here" map of the entire mall. The Golden Fisherman statue has been recovered through an anonymous tip. It was found in Alabama dumped in a creek. Abandoned no doubt due to the press its theft was receiving and the fact that it had no value. It was made from the melted down pieces of donated items belonging to families of different local fisherman. 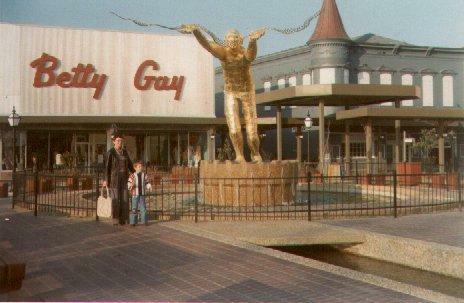 Although the statue was initially considered quite ugly by most locals, (I always thought he looked like Dave Oreck, the vacuum inventor), it did mean something to many of us. In its original location there in your picture, it had plaques surrounding it with the names of all the Biloxi families who worked in the seafood industry. My grandfather's name was on there and that always made me proud. When it was moved to the Seafood and Heritage museum on the north side of the Biloxi/Ocean Springs bridge, the name plaques were not moved with it. I had to laugh a little at anonymous' remark about the Vieux Marche being on a side street near the mall. Because they are actually almost ten miles apart. VM being the urban renewal project in Biloxi's downtown and Edgewater Mall being almost on the Gulfport line. McRae's Dept. Store wasn't in Edgewater until the mid/late 1990's. They built a two-story store there in a mall expansion then. The only McRae's on the coast before that was a founding anchor store built in 1981 in Singing River Mall in Gautier, MS (about 25 minutes away). Trust me on this one, I worked there on and off from 1986-1992. It was a little different from many other dept stores of the time with hardwood floors in the aisles and a very prgressive young people's clothing dept. Thanks for the pics. I have lived on the Ms. Coast for 30 years. It is amazing how people remember different things. And, that is okay, as long as others to not take it a factual. Before moving to the coast from Jackson, my highschool sweetheart, brought me to the coast to "see the shopping center". Trust me, this country girl was in awe of an inside shopping mall! We are hungry to see pictures of times gone by, as so many of us have lost our pictures, and our landmarks. Thanks! And do come to see us, ya'll! Thanks a million for posting this photo of the "Golden Fisherman". I am a Biloxi native and was devastated when Katrina decimated this memorial to Biloxi's maritime history and fishing families (mine is one). After being stolen, the statue was recovered and returned to Biloxi, albeit in five pieces. The mayor has promised to erect a new memorial somewhere, sometime, although not necessarily using the Golden Fisherman again. SO MUCH OF OUR HISTORICAL SITES / BUILDINGS were destroyed by Katrina, it is imperative to rebuild / recreate whatever we can.